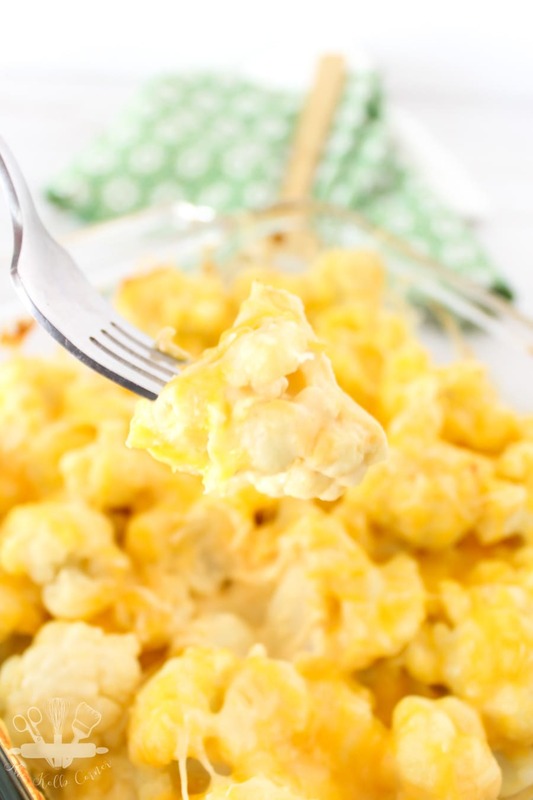 You’re going to love this low carb alternative to macaroni and cheese! 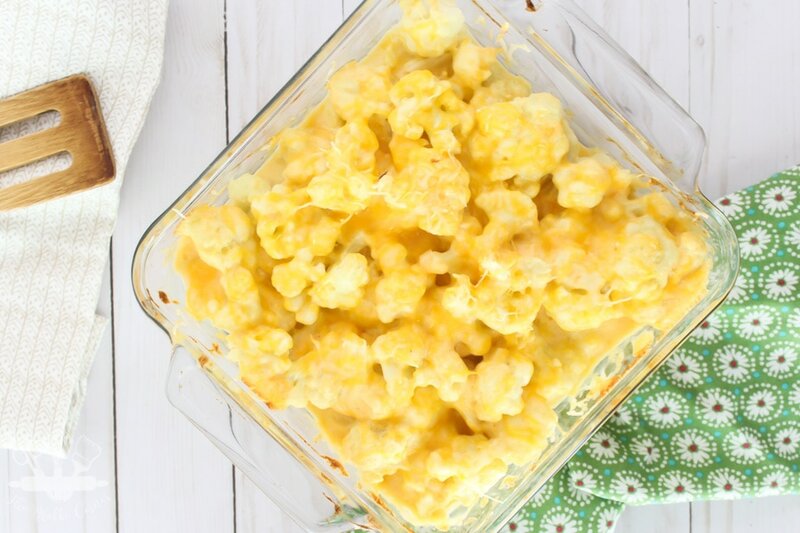 This cheesy cauliflower casserole is so full of cheesy goodness and SO satisfyingly easy to make that you won’t miss the original. 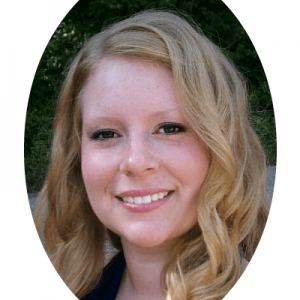 If you’ve been reading for a bit, you know my husband and I recently embarked on a new diet and lifestyle change. So far with the Ketogenic diet we have lost over 60 pounds combined since April. Pretty amazing right? Well with any diet, there are certain cravings that can be enough to break some people. I would probably be one of those people if I didn’t see first hand the results from this way of eating. So what’s on my list of things I miss? First off, bread. Like fresh, hot out of the oven with a crunchy crust, slathered in butter, bread. Excuse me while I wipe the drool from my chin. Something else I miss? Macaroni and cheese. I love mac and cheese, especially the homemade, topped with breadcrumbs, loaded with cheese kind. But let’s be honest, right now I’d settle for the cheap blue box with powdered “cheese” kind and I would happily devour the entire box without remorse. Ok, maybe just a tiny bit of remorse. But how do you make a low carb version of mac and cheese? With my favorite versatile veggie cauliflower of course! 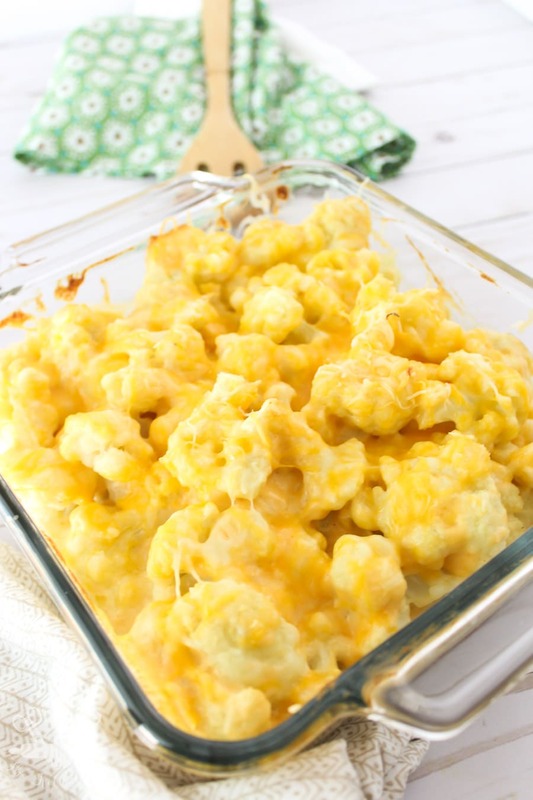 Who needs the blue box when you have this low carb cheesy cauliflower casserole instead? Even if you aren’t following a low-carb or keto diet, you can still enjoy this cheesy cauliflower casserole. It’s a great way to jazz up the everyday boring side dish and with only a few ingredients, it couldn’t get any easier make. Go ahead and top it with crunchy bread crumbs or even crackers to give it a little crunch. I’ll look the other way. Make sure you drain off as much water as you can from the cauliflower after boiling. One reader even suggests roasting the cauliflower instead of boiling for extra flavor and to prevent the sauce from becoming runny from excess water. GREAT IDEA! You can omit the mustard if you don’t like the flavor. I prefer to use a dijon or spicy mustard for extra flavor and kick, but regular yellow mustard works fine too. Make sure to continuously stir the heavy cream when bringing to a boil to o prevent scalding and souring. After the cheesy cauliflower casserole has cooked all the way, turn on the broiler for an extra bubbly topping. A few readers have suggested adding a topping of crushed pork rinds for an added crunch! Perfect! 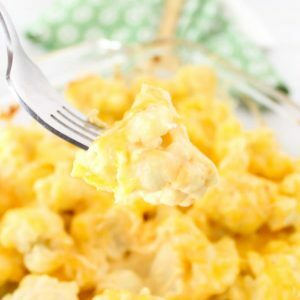 Let the low carb cauliflower mac and cheese stand for about 5-10 minutes after baking to let the sauce get really thick. 33 gms of fat sure is alot. Would leaving out the cream cheese make it tasteless? I think the cream cheese bumps up the creaminess of it. You could try cutting back on the fat content by using half and half instead of heavy cream. Since we are keto, the high fat is what we need! What is the serving size for the net carbs ?? It’s based on 6 servings. The exact amount will vary depending on how big the head of cauliflower is, and floret size. Once baked, simply divide your casserole dish into 6 parts. It will probably be somewhere around 1 cup if measured out. Just had this for dinner. Unbelievably good. My husband and I are in our mid 50’s and decided to change our eating lifestyle for obvious reasons. We are in a low carb diet with daily exercise and it is working wonders. After throwing out all processed canned foods, pasta’s, bread and flour, we feel rejuvenated and elated to be in this journey. Thank you for such a delicious recipe! That’s great to hear Kay! Good luck on your journey. We have a family picnic tomorrow in a town about 2 1/2 hours away. Do you think it can be prepared and then baked several hours later? Hi Krista! I have not tried it, but I would think as long as it stays refrigerated (or in a cooler) until time to bake it should be fine. Just made this for dinner. As I tossed the cauliflower in the cheese sauce it was nice and thick but when I pulled it out of the oven the cheese had thinned out quite a bit. Is there anything that I did to cause this? Could the cauliflower cooked more and released excess moisture? It’s really good. I’d just love it to be thick out of the oven. Hi Rachel! Sorry you had an issue. I’m not sure what could have caused this, as every time I make this it has not been runny. I had the exact same issue (the sauce thinning out in the oven). It also took an extra 10-15 minutes in the oven to get brown and bubbly. I steamed the cauliflower and patted it dry but will try roasting it next time when I have more time to spend. Regardless, it was SO delicious! 🙂 Thanks for the recipe! I bet roasting would definitely help! I’m so glad you enjoyed the recipe! I roasted my fresh cauliflower on a sheet pan in the oven instead of boiling it in water. Stacye: How long did you roast your cauliflower? Hmm. Well I just checked it with a fork and when it seemed tender enough I took The tray out of the oven. I wanna say it was about 15 to 20 minutes at 400F, but I didn’t write it down, so keep an eye on it! I tried my own version of cauliflower Mac and cheese last night for dinner. Sooooo delicious! My hubby said it felt like he was cheating on his diet. I call that a success! How many calories is in this? I’m using My Fitness Pal to track my food and it requires calories to create a food. Thanks! Hi Tori. If you are asking the size of a serving, the recipe calls for a 9×9 pan and the nutrition facts are based on 6 servings. So the 9×9 pan is divided into 6 equal parts. I couldn’t tell you exactly the cup or oz of that, but hopefully that answers your question. That sounds so good Shannon! How many carbs per serving in this recipe? Really excited to try it tomorrow night for dinner! I made this for Christmas thinking only my husband and I would enjoy this “Keto” side. The entire family was asking why I didn’t make more, and ate it all up! My oldest sister who is basically a chef even said it tasted like her creamed cauliflower, which has always been my favorite!! This is now my very favorite side of all times! I used Tillamook Extra Sharp Cheddar Cheese for that extra flavor! WOW… this is delicious!!! Thank you! I am not a fan of mustard.. can I omit it or you don’t really taste it in the recipe? You could omit it! It adds a bit of tang to the sauce, but if you don’t care for the taste then you won’t miss it. My husband doesn’t like the mustard either, hot sauce was a great alternative to get that little extra kick! I’m sure you could but I’m not sure how it would affect cooking time. About how many ounces or grams of cauliflower would you say this is? 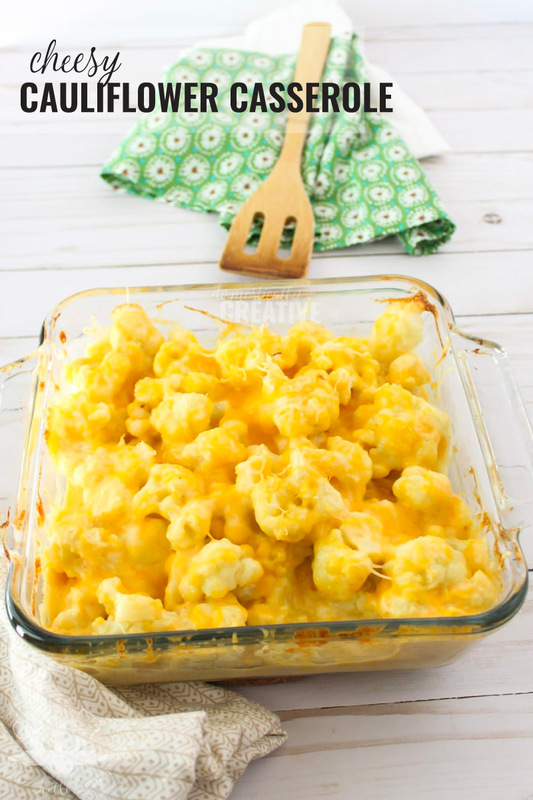 I have a few 12 oz bags of fresh cauliflower florets to use up and this looks perfect! I’m not entirely sure as I haven’t weighed it when I’m cooking. It’s enough to properly fill up a 9×9 baking pan if that helps at all. After make this recipe can I froze it? Hi Cynthia, I haven’t tried freezing this recipe so I can’t say for sure. I would be hesitant with as much dairy this recipe has in it. Crunch up some pork rinds on top add a great crunch and you don’t miss the bread crumbs. Why didn’t I think of that?! Thanks for sharing that tip Betsy! This dish tasted sour and curdled. HI Cassandra! I’m so sorry you had an issue with the recipe. It could be that the heavy cream curdled when simmering. Sometimes if the heat gets too high, or you do not stir often, that can happen. I hope you give the recipe another try as it really is one of mine and husbands favs! In the UK we simply call this ‘Cauliflower cheese’ definitely no ‘mac’ involved so the title is a bit misleading. I made this and added taco meat to it and crushed up pork rinds for a crunchy topping. It was delicious! Definitely took away my craving for the blue box stuff. Felicia you are a genius!! Thanks for the idea!! I made this and it was good, but didn’t remind me anything of mac and cheese. More like cauliflower and cheese. Holy. COW! This was amazing! Added bacon and red pepper flakes on second batch and was truly heavenly! My new keto cauli go-to recipe! Just made this as a side dish to my Chicken on a keto diet. DELISH! Thank you for the recipe! I made this recipe with some modifications, more of a vegetable casserole. I used frozen cauliflower and added brocolli florets, red and green peppers and since onions, because my hubby, a huge meat eater, decided he wanted some. I steamed the vegetables instead of roasting them. I subbed some of the cheddar for jalapeno cheese to give it a kick and chopped a vegetarian sausage and added it also. (https://www.target.com/p/field-roast-italian-vegetarian-sausage-12-95oz/-/A-53129347). My hubby loved it and i have already gotten a request for seconds. This is simply FANTASTIC! perfect macros for me and beyond delicious. Great side for a meal or perfect on its on with a green salad. I’ve made a ton of actual Mac & cheese in my many years. I’ve also tried a few Keto versions and this one is by far the best. This is a staple for me!